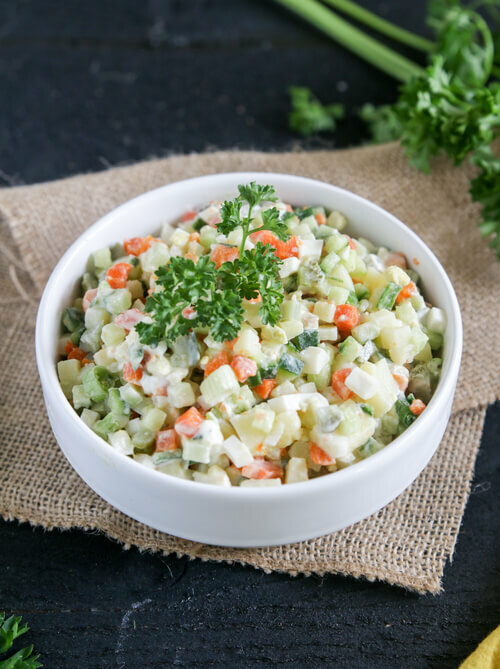 Olivier Salad is a Russian version of potato salad. Most Olivier recipes call for a Russian Bologna, which is a pale pink bologna that has a smooth and smoky taste. I skip the bologna because it's processed, and I think the salad has enough protein and vegetables in it, that skipping bologna won't make a big difference in taste. The potato and peas are a good source of energy and actually, potatoes are the best energy producing vegetable. Carrots boost vision as well as stimulate gums and induce excess saliva. Boil 2 carrots, 2 potatoes; just until soft. Let cool down completely. Boil 5 large eggs for five minutes. Let cool down completely. Peel and chop potatoes, carrots, and eggs. Chop 1 stem of green onion and 1 stem of fresh dill; add to the rest of chopped ingredients. Drain 1 can of organic sweet peas, add to the other ingredients. Chop 4 kosher pickles and 1 cucumber then combine all of the ingredients together. When ready to serve, stir in 4 Tablespoons of mayonnaise (or to your taste); Add salt to taste.